Horizon Chase Turbo is a first for Family Friendly Gaming. This is the first time we have downloaded and played a video game from the Australian Nintendo eShop. It was a lot of work setting it up too. It took someone here at Family Friendly Gaming nearly two hours to be able to download this game. Why? A new email had to be set up. Then a new Nintendo account had to be registered. Then those two new Australian accounts had to be linked. Finally the downloading took forever since we were connecting so far away. Once all of that exhausting work was done we were able to play this Outrun like video game. Horizon Chase Turbo has some fun races. The vehicles in Horizon Chase Turbo can be upgraded if you can complete the upgrade races. Those are very important to getting better vehicles. We also collect tokens, and fuel in Horizon Chase Turbo. At the end of the race what we have is counted and added to our coins. When we reach certain coin levels we unlock new cars. Horizon Chase Turbo looks and feels like a 16-bit video game. 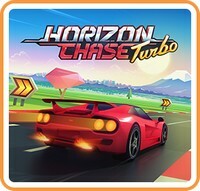 The modes in Horizon Chase Turbo are World Tour, Tournament, Playground, Endurance, and Options. I have not played an arcade racer in some time. Horizon Chase Turbo is a solid arcade racer. I with the bad language had been left out of this game. It detracts from a fun video game. The same goes for the alcohol references. The music in Horizon Chase Turbo is cool to listen to. Be careful getting too far off the road in Horizon Chase Turbo. You will hit objects and flip back around onto the track. We can also bump into other racers and have some strange effects. Horizon Chase Turbo is a one gig download. I found no information of a physical copy version in the United States at this time. Up to four family members can enjoy Horizon Chase Turbo at the same time with a split screen. As I write this review Horizon Chase Turbo is selling or $19.99. If we got a cartridge and a case that would be a really good deal. I question the price point for a digital download. There is plenty of content within Horizon Chase Turbo. Only the World Tour is unlocked at first.